Bathroom remodels have consistently high returns on investment year after year. 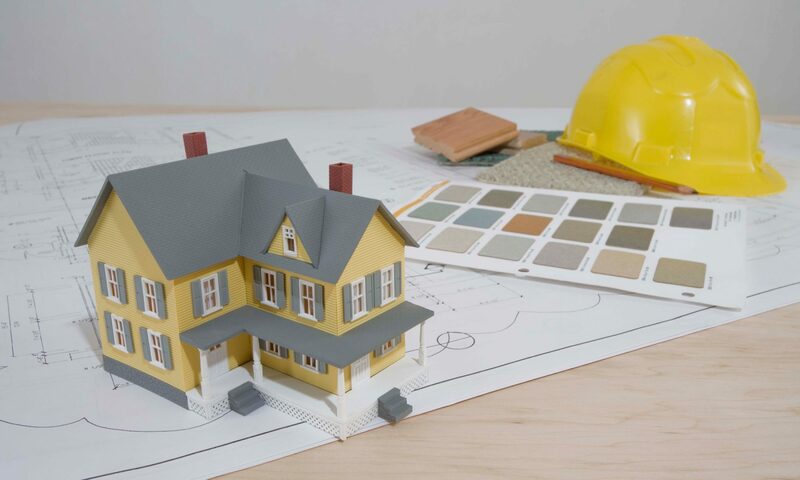 Whether you’re setting your home up for a higher resale value or you simply want to make your mornings brighter, these remodeling ideas are sure to enhance both. The vanity can anchor your bathroom’s design because it is central to both your routine and the physical space. Updating this feature can be as simple as refacing the cabinets and as complex as ripping out the old for something new. Floating vanity: These features are popular because they add modern flair and create clean lines. What’s more, they can be floated at any preferable height and leave floor space for radiant heating or storage. Comfort height: If you find yourself stooping and overreaching to use your vanity and sink, it’s no rare inconvenience. A little more than a decade ago, designers realized the standard height vanity at 32 inches wasn’t cutting it. The new “comfort height” standard is 36 inches. A second sink: Many homeowners have been dreaming of a second sink since their childhood battles in the family bathroom. If you have the opportunity and the space, adapt your vanity or install a new one that will accommodate. Standard showers and tubs are built for function rather than inspiration and relaxation. 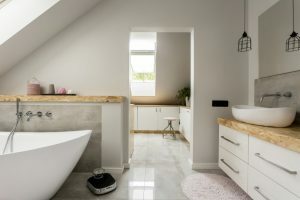 Updating or enhancing these features can transform your bathroom from a basic, functional room into an enjoyable retreat. Freestanding tub: The tubs are popular, and they can give your bathroom a quick visual turnaround. In fact, they can stand as a design statement rather than a sunken necessity. Plus, they’re available in magazine-worthy finishes like wood and copper. Multiple shower heads: Additional shower heads aren’t just a luxury option. They add convenience, especially if you’re installing a handheld style to go with a stationary rainfall shower head. Curbless walk-in: Make your bathroom more accessible and more appealing for resale. Accessible features move higher up on home buyers’ priority lists every year. Kicking the curb on your shower makes it safer for older adults and those with disabilities — and even for yourself in case of a clumsy moment. If you’re living with ratty old wallpaper and last century’s flooring, give yourself a fresh start with new flooring and wall materials. Tile: There are now hundreds of new, affordable tile options for bathrooms. Wood grain tile, for example, is extremely popular. Other options include matte black tile, arabesques and octagons, and patterned tile that you can use as a sink backsplash and art feature. Paint: A simple way to upgrade your bathroom is to freshen up the paint. Choose colors that promote cleanliness, warmth and positivity, like light blues and greens or creams and blushes. There are other ways that bathrooms can evolve beyond the standard that are nearly invisible to the eye. Tech: Smart bathroom technology can make your daily rituals easier and more enjoyable. Consider integrated speakers, voice-activated lighting, smart mirrors and digital showers. Efficiency: Older standard toilets waste a lot of water unnecessarily, and newer standard models use over 50 percent less. It will pay to upgrade to a low-flow, high-efficiency or even ultra-high efficiency toilet! Radiant heat flooring: These heating systems are compatible with most bathroom flooring materials. They warm your feet, but they also heat your bathroom on cold days, reducing strain on your home heating system.